I tuned in to the re-upped ”Murphy Brown” episode parodying sexual harassment training for the newsroom staff. The very idea of getting “trained in sexual harassment” is evidence of language fail and fodder for a humorous show tackling a serious topic. The trainer was priggish; the participants ranged from uninterested to downright hostile. And let’s face it, it’s true that many companies, like this fictional newsroom, have great written policies and require employee training. But that minimal effort no longer serves either companies or employees at a time when every organization in America is or should be examining its culture and asking whether it is conducive to a safe and respectful workplace for all. The impetus for systemic change has been brewing for a while. But it became palpable when 2017 started with the largest collective global protest march. Women in pink hats showed up, woke up and made clear that something fundamental was changing. Since then, women, traditionally loathe to enter the hard knock world of politics, stepped forward by the tens of thousands to throw their hats, pink or otherwise, into the ring. 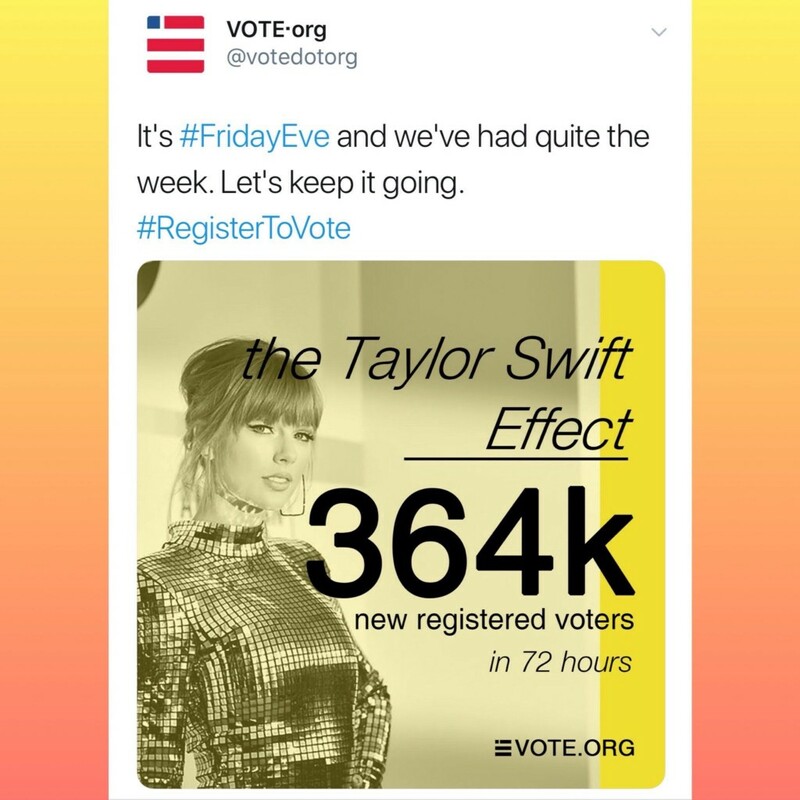 Whether running for office or not, almost 400 thousand more women and men who support the cause were inspired this past week by megastar Taylor Swift to register to vote through Vote.org. Taylor Swift has inspired voter registration. Between the Women’s March and Swift’s exhortations to vote came blockbuster media reports alleging sexual abuse and harassment by Harvey Weinstein followed by a landslide of allegations of sexual misconduct by powerful men in all industries. One after another, these men toppled as women gained the collective courage to come forward to say #metoo — a movement created in 2006 by civil rights activist Tarana Burke. This in turn prompted the #TimesUp initiative. It’s raised tens of millions of dollars to fund legal action on behalf of sexual abuse survivors and most recently announced the appointment of its first CEO, former WNBA CEO Lisa Borders. For many women, the sting of the Senate Judiciary Committee’s perceived disregard of Christine Blasey Ford’s testimony alleging sexual assault by now-Justice Brett Kavanaugh when both were teens rubbed more salt into already painful wounds. I’ve been a movement leader as well as a CEO for many years, and I know that movements can dissipate in the blink of an eye if people don’t keep them moving forward intentionally. That said, this feels and looks different. I don’t know whether women’s push for change has reached a tipping point, but I do know this is a moment of strategic inflection when leaders must make critical choices. Every company and organization is going to have to change. Leaders can make that shift happen intentionally in ways that add value, or change will be imposed upon them by external forces they might not like. 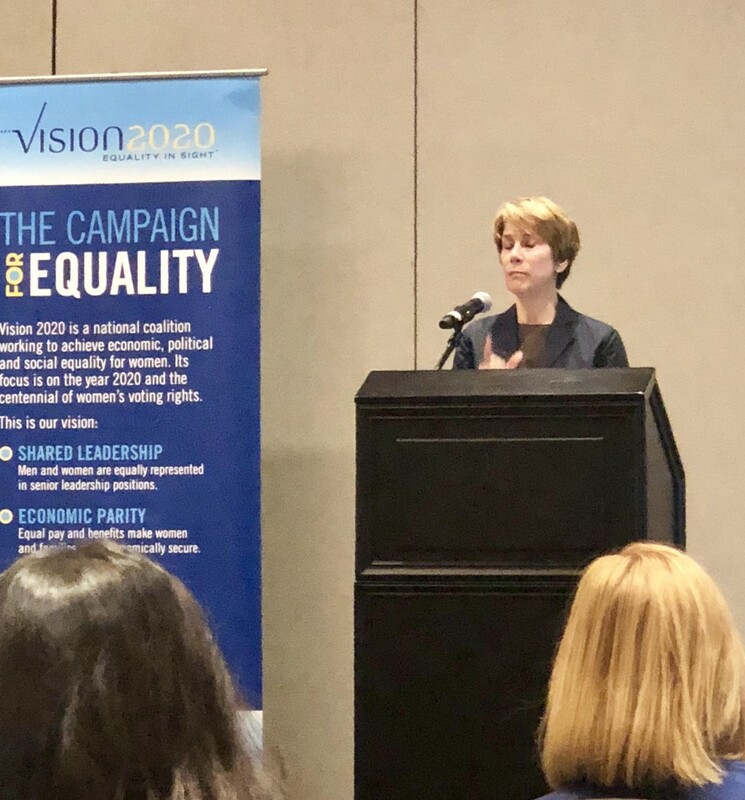 It’s best for leaders to take the lead to create a workplace culture that women want to be in, where they’ll be treated with respect and have equal pay, positions and partnerships. Leaders will have to create work environments where women aren’t objectified and where implicit bias is at least recognized and at best eliminated from recruiting, hiring and retention practices. 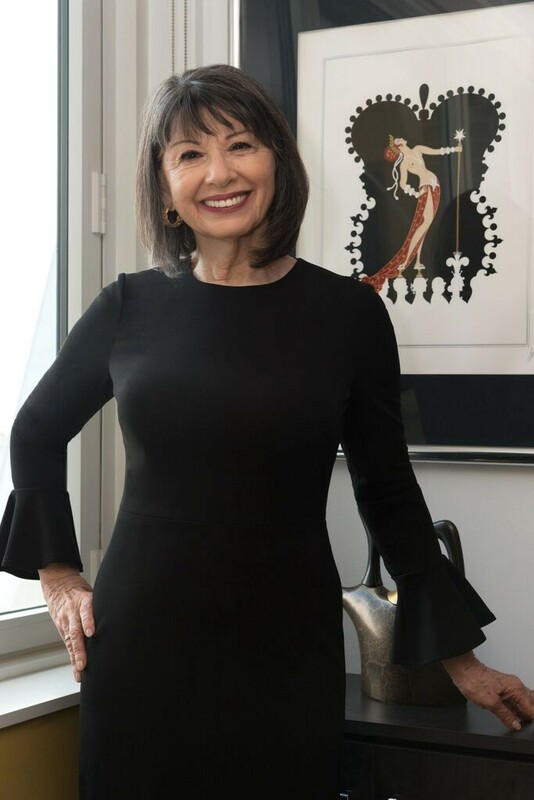 Jewelle Bickford, cofounder of Paradigm for Parity outlines P4P’s 5-Point Action Plan to help companies achieve gender parity. Easier said than done. But here are three practices that can help. 1. Understand and acknowledge transparently that harassment, bullying, and bias are about power and relationships of power. Therefore, the only way to eliminate gender-based harassment is for women and men to have balanced power, pay, and position. Implementing an accountable, time phased plan to achieve gender parity in leadership roles within every organization is the most effective, least costly solution. 2. Have vertical channels of communication. Compliance expert Matt Kelly writes that employees have always talked about harassment, but to their peers, not to management. It’s not unusual for women to warn each other, for example, about which men to stay away from to avoid unwanted advances. Successful companies will proactively create cultures where people talk upward to leadership, not just sideways to fellow employees. That kind of cultural permission has to come from the top and people must see it in action before they feel safe reporting. According to Kelly, companies now must protect and defend their brands not by buying off accusers but by exhibiting strong ethical standards. 3. Provide training opportunities for men and women to practice communicating more effectively across gender and culture. Men and women are not from different planets. It’s our culture that imparts gender-specific communication styles, largely rooted in a power structure that no longer serves us. Women don’t need to be “fixed” or become more like men, nor do men need to be afraid to speak up or to go to lunch with women. Everyone benefits from communicating effectively across genders. Companies have many reasons to make culture changes. It’s the right thing to do. It’s the prudent thing to do to avoid lawsuits and sullying their brands. And it’s the smart thing to do for the bottom line. There’s plenty of research to show that companies with more women in upper leadership make more money. Government entities with more women make better decisions. 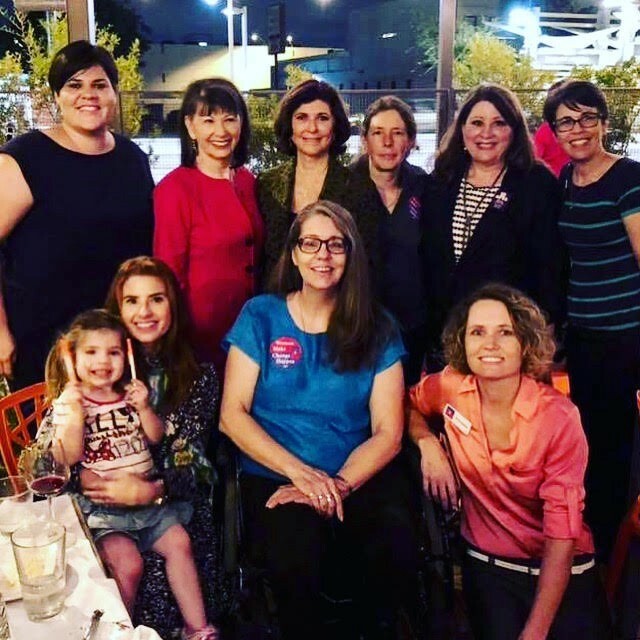 Arizona List has endorsed 91 female candidates this year, most ever. Here I’m with some of them. Women earn the majority of college degrees, making them the core of the knowledge-based workforce. Add women to a male group and raise its collective intelligence. And a Harvard Business Review study says women respond better under competitive pressure. How about that for breaking stereotypes? To stay ahead of the curve in the marketplace and attract top candidates, businesses will benefit significantly from advancing gender parity in the workplace. To do this, women and men must work together, talk together, and become each other’s allies, support systems, and mentors. Leaders at companies will also have to dig deeper and have conversations that activate real change, including equal pay, equal leadership, and a zero-tolerance policy for sexual harassment. Businesses will need a solid program that gives women the tools to advance and both genders will have to recognize and wrangle with implicit biases in order to wring them out of the system. Moving forward, it’ll be the only way to run a successful company. The time for anything else has passed.